Of course we also take her to see a lot of other things. and red fields of poppies. 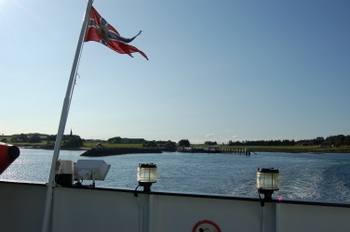 Every summer it is on our list, a visit to the North Sea island Smøla, west of our cabin. Half an hour to drive, a little waiting for the ferry, 20 minutes on sea and there we are. Well, there we are, kind of. Our goal is always out at the very tip of the island, the small fishing village Veidholmen. A place with such charm, I have to pinch my arm every time I come there.Is this a dream? Sometimes I dream of living there. Breathing in the fresh air from the sea, falling a sleep listening to the seagulls, let the North Sea wind blow my hair. A 56th anniversary is worth a special celebration. We decided to spend the day on the small island Smøla, where my mother had never been before, my father once when he was a boy, another time around 50 years ago. First part of the celebration was already on the ferry, with coffee and svele, this special "pancake" which is served on all the ferries along the western coast of Norway. salted fish balls, a local delicacy. if only to eat Ingrid´s salted fishballs. The small island day ended with the outdoor play, Fru Guri av Edøy. the weather was icy cold. my father 80 and mother 83 never forget to smile. And a little wind is not a bad thing on an island filled with windmills. And when I am back in Trondheim I´ll mail you your postcards. Life wasn't always serene like today. To reach Smøla from our cabin we have to drive for about 25 minutes, and then take two ferry rides. We woke up Monday morning to a bright, smiling northern summer sun, had breakfast on terracce, made some extra coffee to bring with us, and started our adventure. First stop was already on the ferry quay with coffee and home made waffles made by a local lady - we were well prepared for the day. Smøla is a small, flat island, or rather thousands of small and bigger islands out in the North Sea, south west of Trondheim. I haven't found out how many people there are living there today, but I can guess that there are a couple of thousands liveing there all year round, alot more during the summer months. Our day was beautiful, and the island showed it's buttered side as the locals love to say. But life isn't always like this. Smøla is and has always been an island for fishermen, and when you live of your fishing you are bound to go out with your boat no matter how hard the wind blows. 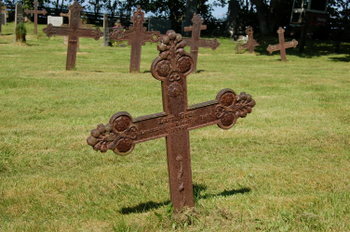 The first thing we met when we boarded the island was Edøy Old Church and the churchyard on it's western side. 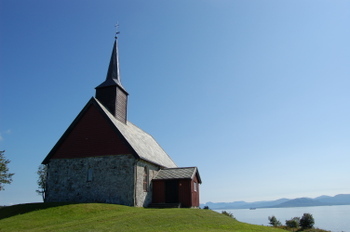 The church might be more than 800 years old, and is beautifully restored in stones and red painted wood. Through the centuries the church has seen everything, joy and sorrows, baptism and funerals, the shy smile when a young woman gives her yes to a young man, the tears when the same woman are there years later, dressed in black, following a coffin. I embrace my beloved ones, thankful that I have them all close to my heart, send a thanks to God for the blessings he give me every day, and send a thank to the people who have walked before me, making my world a peaceful,sacred place. And I send another prayer to God for peace for all people. 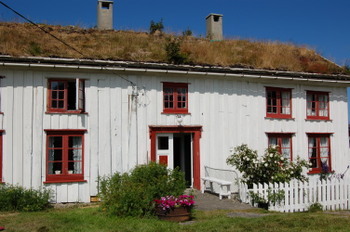 At Smøla, a small island in the North Sea, you can find an old house with white painted walls, dark red paint around the windows, grass growing on the roof. 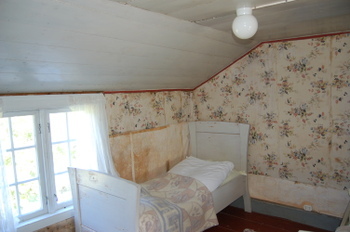 The house has been the home for generations during several hundred years and is marked with signs of love and work, hard and stormy winter days when the wind made it impossible to open the door, warm and sunny summer days when thousands of roses were in bloom. 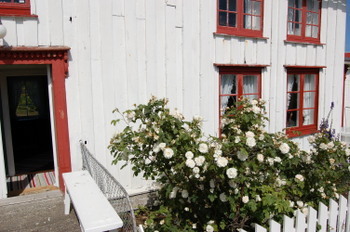 Oliva came to this house as a young bride with white roses in her bridal bouquet, she was the last person to live in "Olivastua", and her name has therefore been given to the house. The first thing Oliva did after moving in with the love of her life was to plant one of the roses from her bouquet. The rose rooted, just like Oliva did, and though Oliva died about 40 years ago, the rose survived and is blooming with hundreds of sweet smelling roses every summer. Oliva never had a child of her own, and when her husband died she and her cat were the only remnants in the house. 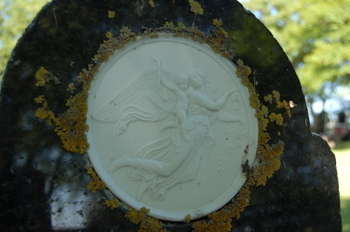 All the love that was in her meant for her own babies were spred out on the other children on the island. They loved to visit Oliva. She had stories to tell about days long gone, she had songs to sing, there was always home made suger covered cakes in her tins, and she had a smile and a hug for everyone. Oliva was never lonely. In the summer she had her garden, her cooking and baking and all the work which followed the small farm. And during long winter nights she knitted. She subscribed to a magazine from Oslo, and every second week she got a thrill when she found the newest issue in her mailbox. Together with stories about people living totally different lives from her, there were recipes and patterns in her magazine. Olive loved to flip through the knitting patterns, sweathers in bright colours, chic hats and mittens, lace patterned table clothes. In her dreams she made it all, and her dreams sometimes took her on long trips around the world, visiting exotic and far away places. All through her dreaming her fingers were fluently working the needles, and knitted quilts made of scrap wool were created. Running out of wool was no problem for Oliva. 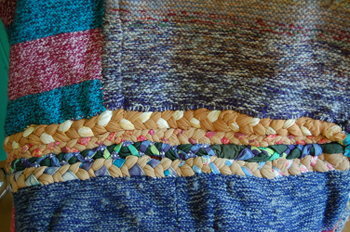 If the quilt was still too small when there was no wool left she just cut up her old nylon pants and worn out aprons, braided them and sewn them to the quilt. 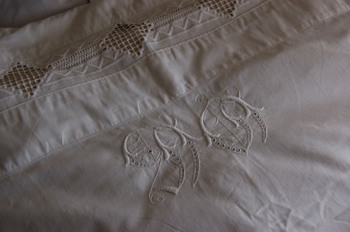 The quilts were used to cover old chairs, and they gave the best warmth during cold winter nights. Guest were treated royaly in Olivastua. They got to sleep in the best bedroom under the best quilts decorated with English embroidery, filled with the smoothest and softest bird feathers Oliva had gathered around the island. 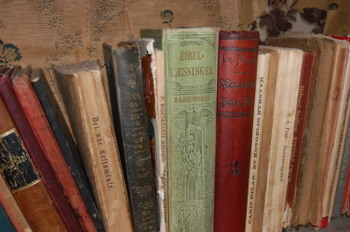 And from her book cabinet Oliva found one of her Bibels or religious books which she put near the bed to be sure that you had the proper litterature to read before sleeping. Oliva had a secret passion - old photos and frames. Photos filled almost all the available space in her "bestestue" (livingrooom used only for guests and on Sundays), and when the tinker passed by her house every second months she couldn't resist buying more frames. Old and gone family members, made eternal through her portraits were her very good friends and advisers. Framed photos filled every inch of space on tables and on top of cupboards and hutches. 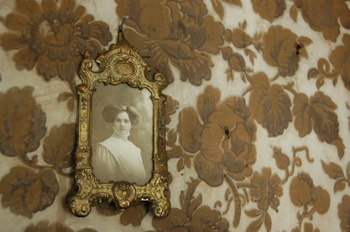 Only on the walls she laft room to show her pride, the brown rose wall paper.